I played a lot of games at PAX East 2018, but none of them captivated me like The Messenger from Sabotage Studio did. We live in a world where everything old has been remade, revisited, remastered, and repackaged for years. You’ll never see me complain about this. Some of my favorite games of the last several years have been born from the hearts and minds of my generational peers remembering the games we loved and putting their own spin on it. 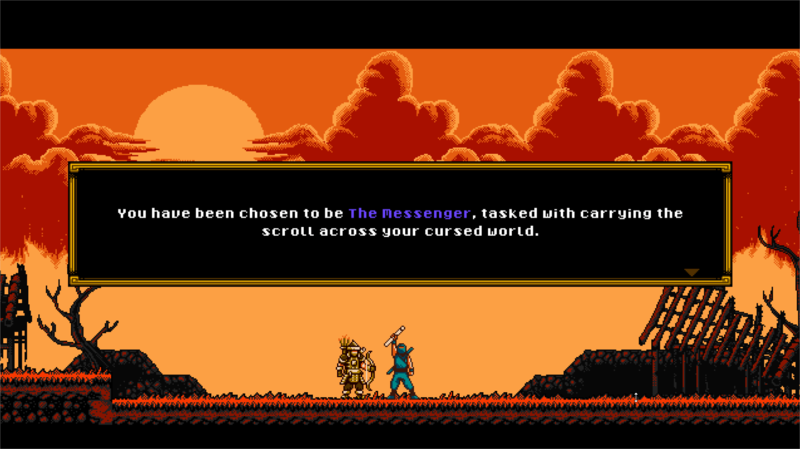 Simply put… The Messenger is a modern response to the Ninja Gaiden series from the NES era. Sabotage Studio is a team full of people who love that game and have gone out of their way to show their reverence in game form. They have put their love for Ryu Hyabusa’s first adventure on display with this game. With that said, I didn’t just fall head over heels for some random ninja game. This has all the makings of a classic if my demo is any indication. With that said, there are three things that really stood out for me in my short time with the game. I’ve never met a ninja, so I could be making broad and baseless assumptions. But, I’m willing to bet that most of them are pretty quick. I doubt I’m alone there. Ninja games have play fast enough to match that assumption for me. I can’t imagine a slow and plodding combat game like Dark Souls suiting the theme. Fortunately, The Messenger does exactly what it should and more. I was immediately impressed with the game’s snappy controls. Every button press resulted in immediate action. By the time I was done with my (painfully short) demo I was rewarded with fluid movement and fast action. Nothing felt like it was getting in my way aside from the enemies. It was a great feeling. There is more to The Messenger than well designed controls though. Sabotage Studio gives us plenty to do. The coolest game mechanic is the “Cloud Step.” The Cloud Step is an extra jump that you can take any time you land an attack on something while jumping. This jump remains charged until you hit the ground. That leads to some very interesting path choices as you get deeper into the game. This combined with a wing suit and time travel portals spread throughout the levels makes for some beautiful runs. I barely stumbled my way through the demo, but as I did I could imagine the runs that would be put together by skilled players. This is going to be a glory to behind in a few years at an AGDQ event. The music was just short of divine. Just listen to the video below to see what I mean. I waited in line for a while to get a chance to play the game. I was VERY grateful that the music was as good as it was. I went into my demo expecting an interesting, retro-inspired ninja game. I got that. What I didn’t expect was to find myself laughing in the booth. The overall plot of the game wasn’t particularly funny, but the writing for the supernatural characters like the otherworldly shopkeeper and the demon who brings you back to life should you die were very funny. I can’t wait to see what other funny bits the team is cooking up for us. I went into my demo excited and came out of it hyped out of my mind. Its all I wanted to talk about when I called home to talk to my kids about it. The Messenger will release sometime this summer for PC and Nintendo Switch and I can’t wait to play. What do you think? Sound off in the comments and let us know your thoughts!